Yesterday I shared the basics of what Project-based Learning is and key things to include when planning your own PBL units. Today I thought I might offer some resources to help with planning these types of learning activities and tools that may help when implementing Project-based Learning units for both a facilitator (you) and learner. Since a lot of you are eMINTS teachers I also included some extra technology tools you may find helpful. Edutopia has videos that overview and show examples of Project-based learning activities in action. Wikipedia has an article dedicated to Project-Based Learning although it is noted that the article still needs minor improvements in working and references. The Buck Institute for Education offers educators what they call FreeBIEs including planning forms, student handouts, rubrics, and articles free for educators to download and use while designing PBL units. 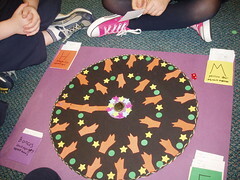 Math Projects has a listing of math projects connected to real life. High Tech High shares PBL projects listing including videos and other descriptions of student created projects. g2 the Global Generation Project is one middle & high school’s website documenting their work to create a project-based school environment. Be sure to check out their projects. PBL Checklists is another tool from 4teachers.org share timesaving educational resources that use technology to improve instruction across all content areas and grade levels. What tools and resources do you think should be included in this list? Leave a comment and share your favorite PBL links.